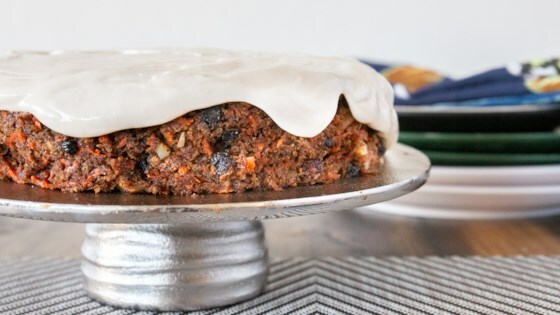 "Thick and creamy, this 100% vegan frosting is delicious on carrot cake and pumpkin breads." Beat the cream cheese and margarine together with the vanilla extract in a mixing bowl with an electric hand mixer until light. Beat in the soy flour, followed by the confectioners' sugar until light and fluffy. Refrigerate at least 20 minutes before using. this frosting is delicious - great creamy texture, nice and sweet and really easy. I substituted vanilla bean for vanilla and added a couple of tablespoons soy milk to get a good texture-didn't use soy flour. Very good, using vegan cram cheese. A bit runny, but excellent taste. Only one person liked this. It had a weird aftertaste and everybody ended up scraping it off their cake.